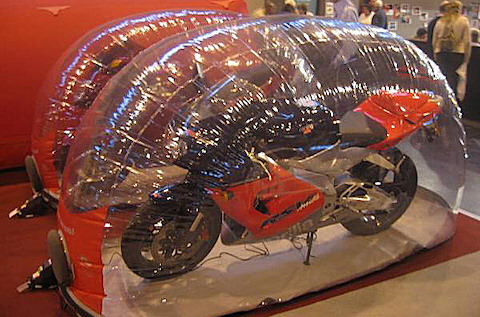 The best way to protect your motorcycle from damp, corrosion, mildew, dings, dents, scratches, dust, pets and children! 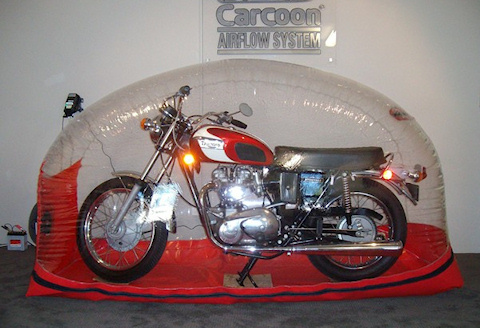 Carcoon Bikebubbles - motorcycle storage / protection systems. The Bike Bubble is the ultimate storage solution for your cherished machine, be it a classic or a super bike. It's unique active airflow process along with optional battery management system and other advanced features set a new standard in motorcycle care. Available in two sizes in both indoor and outdoor types. Special size units also available. For the serious motorbike collector consider the Drive-in Carcoon, as it allows a number of bikes to be stored in an extremely controlled environment. 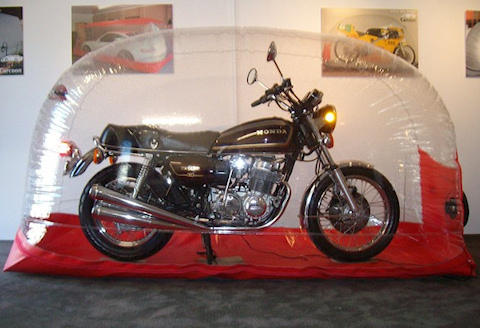 Bikebubble creates a mini protective environment around the bike. Within the storage environment air is continually re-circulated using Activated Carbon filters. The result of this inner circulation means the bike is effectively stored in its own clean room and protected from the elements during the damp winter months. We have two sizes of Bikebubble available with two colour options- clear with regal red trim or clear with royal blue trim. Solid colours are also available i.e. no clear panels at all. Motorcycle not used for weeks at a time? ~ Keep your classic / restored motorcycle in A1 condition ~ More effective and a lot less effort than typical processes for winterising (winterizing) a motorcycle....the ultimate motorcycle storage solution.